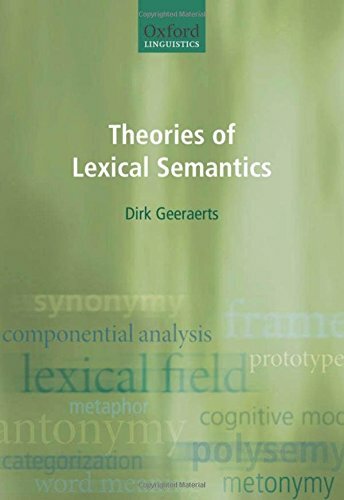 Theories of Lexical Semantics offers a comprehensive overview of the major traditions of word meaning research in linguistics. In spite of the growing importance of the lexicon in linguistic theory, no overview of the main theoretical trends in lexical semantics is currently available. This book fills that gap by charting the evolution of the discipline from the mid nineteenth century to the present day. It presents the main ideas, the landmark publications, and the dominant figures of five traditions: historical-philological semantics, structuralist semantics, generativist semantics, neostructuralist semantics, and cognitive semantics. The theoretical and methodological relationship between the approaches is a major point of attention throughout the text: going well beyond a mere chronological enumeration, the book does not only describe the theoretical currents of lexical semantics, but also the undercurrents that have shaped its evolution.